In 2013 a small group of outdoor swimmers wanted to organise a regular swim in their local reservoir. Yorkshire Outdoor Swimmers was born out of the need to formalise our attempts to gain official permission to swim at Harthill. We spent most of the summer of 2013 planning, writing risk assessments and convincing the owners of the reservoir (Canal and River Trust), Rotherham Sailing Club and the fishing club to agree to our requests. In August of that year, we ran our first test swims with 30 swimmers trying out the waters at Harthill for the first time. By spring 2014 YOS was born, regular weekly swimming sessions began at Harthill Reservoir and an annual membership fee was offered to cover insurance costs. We were hoping that a few people would join and to have a good number of regular swimmers at each session, in fact over 500 people joined and our summer swim sessions were brimming with families, triathletes and groups of friends all swimming together. Since we began over 1600 people have enjoyed a swim with us at Harthill. Swimmers have visited from London, Scotland, Australia, South Africa and Hong Kong. We had Radio Sheffield broadcasting live whilst wading into the water, world records have been broken at YOS and our swimmers have represented the club in competitions all over the world. We are so proud of what YOS has achieved in the last 4 years and excited to see what the future holds for the club. 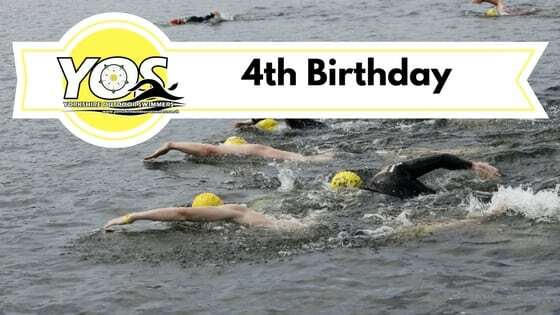 On Saturday 14th April we will be celebrating with a birthday swim, some fun races to kick off the summer season followed by delicious pie and peas. We would love it if you can join us for some of or all of the afternoon. Click the button below now to book your pie and peas.